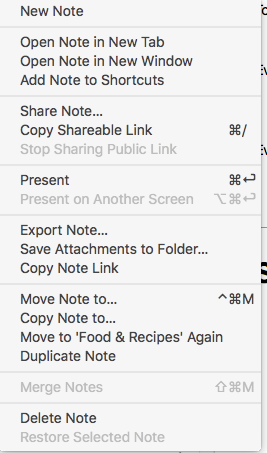 Is there another way to copy a notes "classic link" (evernote:///) rather than going to the note and pressing opt+control-click then mousing down to the "copy classic note link"? I looked in applescript but I think it only covers the regular note links ( Also there is a keyboard shortcut for copying the normal link (on mac cmd+opt+ctrl+C) but not the classic link. Making this easier to do would help me out and I wonder if other people would like this as well. I couldn't agree more on this! The evernote:// link is essential, if not mission critical for me! Keep in mind that the new functionality will still paste an evernote:/// link within evernote. So if your pasting destination is evernote itself (such as adding a link in one note to another note), you don't need a classic link. But, I also agree, a keyboard shortcut for classic note links would be great for the times (fairly often) when pasting outside of evernote and the evernote:/// link is desired. Or at least place it as a menu bar item so that we can create a shortcut manually in the Mac system preferences. I mostly use it with omnifocus. So, it would be good to have some kind of access to it (via applescript or keyboard shortcut) so I could automate. Thanks for the reply! I'm the same, I'd say half of my note links are evernote:/// links I paste into my calendar application and my to-do list application (Wunderlist in this case) so a menubar item/hotkey would be ideal for me. In the mean time a few extra clicks isn't a deal breaker, but it's not luxurious either! Very glad to have stumbled upon this thread - I've been wondering why note links pasted in other applications have been taking me to evernote web! I emailed support about this last month but the respondent clearly wasn't aware of the change and just had me reinstall Evernote! All of my note links are for my personal use; some within Evernote, but more than half within other apps (Onnifocus, calendar). So as far as I understand it, I always need an evernote:// link. In fact for a user like me who doesn't use Evernote web and doesn't use my other apps on machines without the Evernote application installed, I simply have no need of the newer web-based note links. And so an option for "classic" note links to be my default would be ideal. Unless I've misunderstood something? Hilariously, NONE OF THE LINKS YOU POSTED WORK. Could you stop wasting people's time? I'm trying to get Evernote to allow me to copy and paste a link to another program that will then open within Evernote when I click it. I don't know how you think anything you posted helps me with that. Evernote guys: please, please consider this. Removal of the classic note links as default was a bad enough regression for power users (albeit an understandable choice for others), but making the classic links so hard to get to is a total pain. The best, most mac-like choice would be to make the 'classic note link' available as a 'Note' menu option when the opt key is held (cf Finder Go->Library). That way a user can add their own App Shortcut in System Prefs. Correct. Classic note links paste as Evernote:/// no matter where you paste. I agree too. Having links summon the browser instead of the Evernote app is a huge pain for me. Links do not paste as "evernote://" within Evernote for me. If I copy a link to page in Evernote Mac then paste it (cmd+k, cmd+v), it pastes as a http:// link, and opens a browser if you click it. Right-Click > Copy Note Link copies a context-sensitive link. Outside of Evernote, Command-V pastes ONLY an external web note link (https://www.evernote.com/...). Option + Right-click > Copy Classic Note Link copies an internal app link ONLY. I.e. wherever one pastes it (within or outside of the Evernote app) it will be an evernote:// link. I hope that this explanation helps. I only wish that I could make "Copy Classic Note Link" the default because I never use web note links myself. Thank you! That's not ideal, but I just tried it and it will work for me. I just can't link something to my own description - I have to use the link text == the linked note's title. That's Ok. The behaviour your describe is expected. This is not expected behaviour. It is a bug which we expect to fix in the next release. Note links should always paste as evernote:// when pasting into Evernote itself. As a workaround, Control-click on the note, hold down the option key and select "Copy Classic Note Link"
Read the OPs description more carefully - what they are experiencing is expected because they are using cmd+k, cmd+v to paste the link within evernote - which opens a web address link dialogue box and pastes within it - as expected - a web link. As I described above, simply pasting within evernote (i.e. just cmd+v) does indeed paste an evernote:// link. The way to get around this is to option+right click on the note then Copy Classic Note link. Then highlight the text where you want to create the note link, hit cmd+k and then cmd+v the Classic (i.e. evernote://) Note Link. That way you can link a note to your own description rather than the linked note's title. I read it and understood it. The fact that it doesn't work that way with cmd-k is a bug. Thank you for contacting Evernote Support. My name is Linda and I'll be working with you to resolve this. I apologize for the confusion regarding the new note link behaviors. The recent changes were made by design to make it easier for users to work with. Thanks. I'll contact the support team and try to clear up the confusion. So, have I missed something or am I correct in my assessment that as of today (2014-06-10) there is no way to get the classic note link (evernote://) with a keyboard shortcut or through any automated means? That seems to be a correct assessment. Although I haven't looked at what automator/apple script could do here, so I can't say for sure. Ok, thank you. I hope they come up with a fix for this nonsense soon. Ideally, we get the ability to grab the evernote:// link from mobile devices as well. Thanks for the discussion. I am new to Evernote, and I appreciate all your experience. A) my conflicting shortcut-key assignment in using Moom. my slowing down and reflecting on what I think the API and what the UI are really telling me. It would be great if the Paste preserved the links, I had to paste and manually copy the link onto the selected style lines above, ... a bit of a cludge work around and prone to error. Just wanted to put in my 2 cents to say this feature would be so amazing. I use "Copy Note Link" many times a day and could save lots of time with a keyboard shortcut. Thanks in advance Evernote dev team. Love your work!!! Any progress on this? The inability to quickly generate links back from another app to a note I have in Evernote Desktop makes the EN application next to useless. -- display notification enLink with title "Note"
set copyLink to copyLink & enLink & "
display notification copyLink with title "Copy Evernote classic note link" subtitle ((count of foundNotes) as string) & " notes processed"
The applescript is from Sander Robijns. It's wrapped in an alfred workflow. If you use alfred then just use Sander's workflow. If not, use the applescript and trigger it with other automation apps (i.e. Keyboard Maestro or even Services in OSX). I think this is a suitable workaround. This is a huge help. Thank you very much. Love Alfred, but I'm moving a lot of my non-advanced workflows over to Keyboard Maestro. It's terrific that this applescript-generated classic note link works on iOS, too. Thanks again for your time. Master Ninja (and Sander), this was super helpful. Any idea how to get it paste as the Note Title with the link embedded though? I know this thread is quite old now but short of using the Apple script mentioned, has there been no movement from EN to add this functionality? 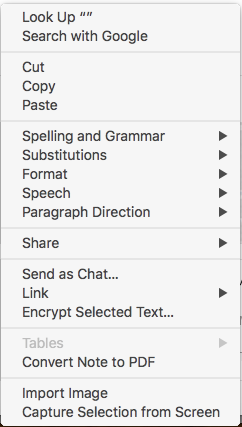 A keyboard shortcut to 'Copy Classic Note Link' (to then paste into OmniFocus) seems desirable to many. I'd like to second Dario006's question. Has there been any progress on this? This is a big me too!!! Oh, and also a big me too on the awesomeness of this Applescript!!! Works like a charm in Keyboard Maestro! Sad that such a simple feature has not been addressed. +1 to get this implemented. Evernote, this is unprofessional. This is the second issue that I stumbled into (the first was lack of clipper support for Google Inbox), and there is not even so much as an acknowledgement or an update. We (at least I speak for myself) pay for your services. A decent support system is the least someone can expect! Three years later it still isn't possible to use a keyboard shortcut to invoke either Copy Note Link or Copy Classic Note Link. I use both many times per day, and have for years now. That's a lot of right-clicking and option key holding that I could have avoided if only someone at Evernote would pretty much flip a damn switch. I've assigned keyboard shortcuts to contextual menu items in other apps. Contextual menu items SHOULD be accessible to the Keyboard preference pane. But they aren't in Evernote. Failing that, I can't see any reason why these shouldn't be main Note menu items: they seem more than important enough. I no longer see any way at all to obtain a Classic Note Link. There is neither a main menu option nor do any combination of keys such as pressing opt+control-click bring up an option for this. As I said, neither of these options appear for me. The Copy Note Link is the standard internal link, not the classic link. Right-clicking the note in the note list gives the exact same menu. >>Right-clicking the note in the note list gives the exact same menu. Did you see the image I posted? For the love of all that is holy, I can't believe you just wasted my time like this. This thread is about being able to paste Evernote links to outside programs that will open in the Evernote app when you click them, instead of opening the web browser. >>Hilariously, NONE OF THE LINKS YOU POSTED WORK. This thread just made my day! I had no idea that hidden "Classic Link" feature existed. I had stopped posting Evernote links in other apps and pretty much figured they didn't work anymore outside of the Evernote app (since they don't). But now they work again! Upvoted this request but really just happy to find there's a workaround at all!!! I am on v7 and still don't have this option. Right-clicking the note in the note list does NOT bring up an option for Copy Classic Note Link.